Clearly, a complete biography of Jesus would be much more inclusive. John, however, guided by the Spirit, wrote to produce faith and chose his material carefully. His Gospel is very different from Matthew, Mark, and Luke who all used a similar outline to each other. John gave us a deeper glimpse of a few of Jesus' conversations. He focused in depth on Jesus' interactions with a few people. He didn't give us many miracles but instead concentrated on a few signs. Why? 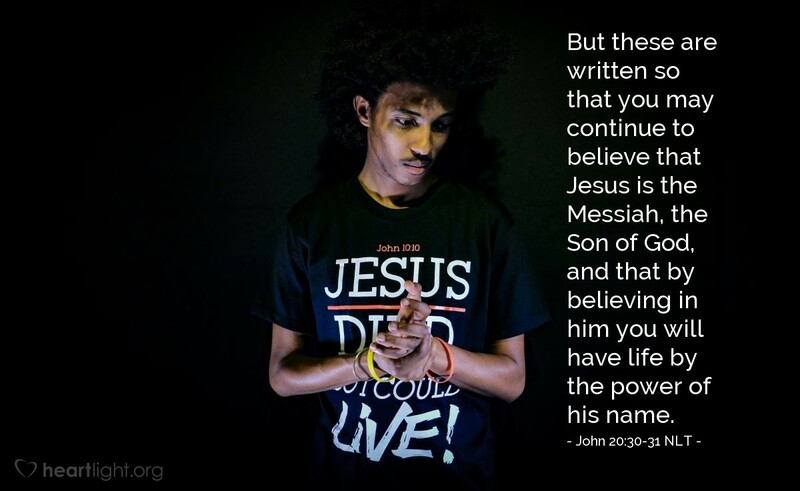 John wrote to help us believe in Jesus as the Christ (the Messiah) and the Son of God. He, just like the other Gospel writers, knew that if we were to find life, it would be in Jesus! Sometime during this Christmas holiday, sit down with the Gospel of John again and read the whole Gospel at one sitting, asking God to enrich and deepen your faith in Jesus and your relationship with him. I do think you will find all of your life blessed in the process! Father, I do believe that Jesus is your Son, the Messiah, and my Lord. Draw me closer to him, both in terms of his abiding presence and also in terms of my behavior toward people. Through your Spirit, conform me more closely to the character and nature of your Son. By the authority and in the name of Jesus, I pray. Amen.